It's funny how through the years, certain flies come to be associated with certain regions. I first became aware of this during my first two real fly-fishing pilgrimages to Pennsylvania's spring creeks and later the Madison River in Montana. My first trip to Pennsylvania was in the late '70s. Being from Michigan, I came prepared with many of the new No-Hackle flies developed by Doug Swisher and Carl Richards. I had recently taken classes with Richards and was well-versed in their Selective Trout theories. Since discovering No-Hackle flies, I had not fished a Catskill pattern for years, favoring the more exacting patterns developed in Michigan. But when I headed east, I still made sure I had plenty of overdressed, classic Variants and other traditional patterns. For some reason, I thought that if I was going to Pennsylvania, I must need the regional patterns locals had used there for years. I did the same thing on my first trip to the Madison. Without any thought of the patterns I fished on the rivers in Michigan, I looked at what was popular in the West and brought those: Elk-hair Caddis and Royal Coachmans. It seemed to me they were all you would ever need there. After all, every suggested fly assortment for the West seemed to start with Elk-hair Caddis, and frankly it is still much the same 30 years later. While the popularity of the Elk-hair Caddis is a strong testament to Al Troth's fly, I wondered if there might be something better. In the East and Midwest, I never did well with the bushy Elk-hair Caddis, and as a result I seldom fished it. I preferred lower dressed imitations that were more exacting. After making my home on the Madison, I found myself still using the old standby, and still finding that when trout move into softer water—especially in the eveningâ€”they become much more selective and refuse an overdressed Elk-hair Caddis. I started taking a closer look at the caddis naturals, and all the patterns that we generally use to imitate them. One night I sat and looked at the caddisflies on the windshield of my truck. The first thing I noticed was that there is very little to them—basically they are tubes with a few short legs sticking out the sides, and a little "V" at the back of the "tent" where the wings extend past the abdomen. I decided I needed something different but before I started tying, I sat down and drew a black-and-white silhouette of a caddis. I do this with every insect I try to imitate. I also created a black-and-white silhouette of an Elk-hair Caddis and was not impressed with what I saw. The palmered hackle distorts the silhouette of the slender caddis body. I have long believed that palmered hackle represents quivering or movement on the water, and it also helps if you want to skate a fly, but this was just too much. Butch: HOOK: #10-18 Daichi 1110 or 1180 or Dai-Riki 305 or 320. THREAD: Olive Ultra GSP 50-denier. TAIL: Amber Antron. UNDERWING: Amber Antron. WING: Elk hair, tied in tips first. BODY: Green Superfine dubbing. LEGS: (Optional) round brown rubber. The first fly I came up with was the Butch Caddis. I wanted a fly that I could actively skate and dance in and out of the water. I wanted something I could literally pull underwater, and have it rise back to the surface to skate again. Hackle is good at keeping a fly on the surface until it gets wet, so hackle would not work. I needed it to pop back after I pulled it under, and float forever on the fast water of the Madison. The tips of hair (any fly-tying hair) are the least hollow part of the fiber and the least buoyant. The Elk-hair Caddis uses just the tips of the hair but I wanted the fly to trap more air, so I inverted the hair to give the fly more overall buoyancy. I did this by tying the hair in by the tips with the butts extending over the hook eye, then pulling the hair back to form a small bullet head. I cut the hair flat on top—a "butch" haircut. Before tying in the hair I added an Antron underwing for a little light refraction. This is a virtually unsinkable fly with a slim body and accurate silhouette, which makes it perfect for mimicking the active short movements that caddis often display. I seldom dead-drift any caddis, preferring to give them short twitches. Be careful not to overwork it, especially in soft water. Twitch it half an inch, and then float freely for several inches or a foot. 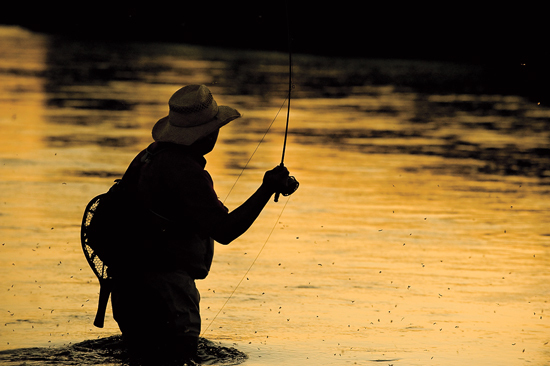 In faster water you may need to skitter the fly with several short twitches over the entire feeding zone. Goober: HOOK: #10-18 Daichi 1110 or 1180 or Dai-Riki 305 or 320. THREAD: Brown Ultra GSP 50-denier. WING: Deer hair. THORAX: Brown Superfine dubbing. HACKLE: Olive-dyed grizzly saddle hackle. The Goober was designed for exactly the opposite situations. This is an extremely exacting silhouette for dead-drifting in slow water during the evening caddis hatch, when trout can be notoriously picky. Again, I started with a black-and-white drawing of a real caddis and then filled in the gaps at my tying bench. This fly was difficult to design because as fly tiers, we become so conditioned to look at flies the way they have always been tied that a slim caddis does not seem like a caddis at all. Luckily the trout don't know this. I have tested this pattern extensively along the slow edges of the Madison, and would put it against any caddis pattern in this situation. It still doesn't look like a caddis to some people—it looks more like a Goober—but you get used to it after releasing your umpteenth trout. Kelly Galloup has been a guide for 35 years. He and his wife Penny own Galloup's Slide Inn (slideinn.com) on the banks of the Madison River.